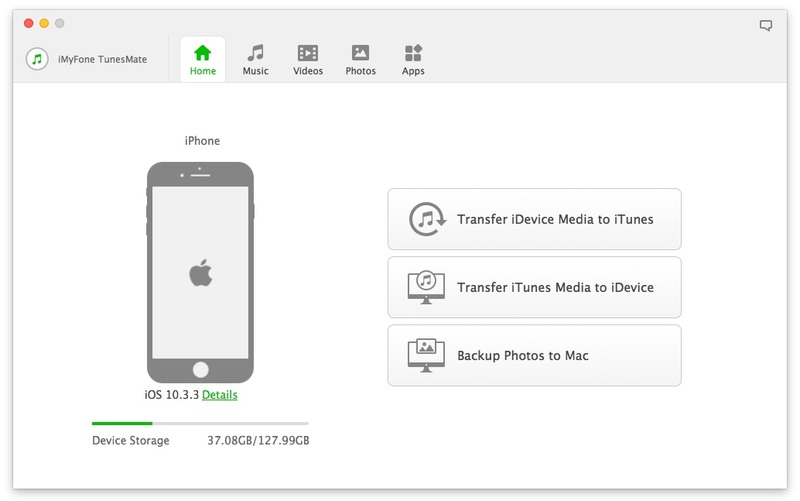 CopyTrans is a powerful file transfer tool specially designed for iOS users to help them transfer their music and videos from PC to iOS 12 iPhone/iPad. This tool is user-friendly, but unfortunately it is only available for Windows and does not have a Mac version. iMyFone TunesMate is the ultimate iOS file transfer tool that not only allows you transfer media files between your iPhone and PC/iTunes, but also offers tons of useful features to conveniently manage your iDevice library and enhance your media transfer experience. Fully compatible with all the latest iOS 12 devices (iPhone 8, iPhone X, etc. 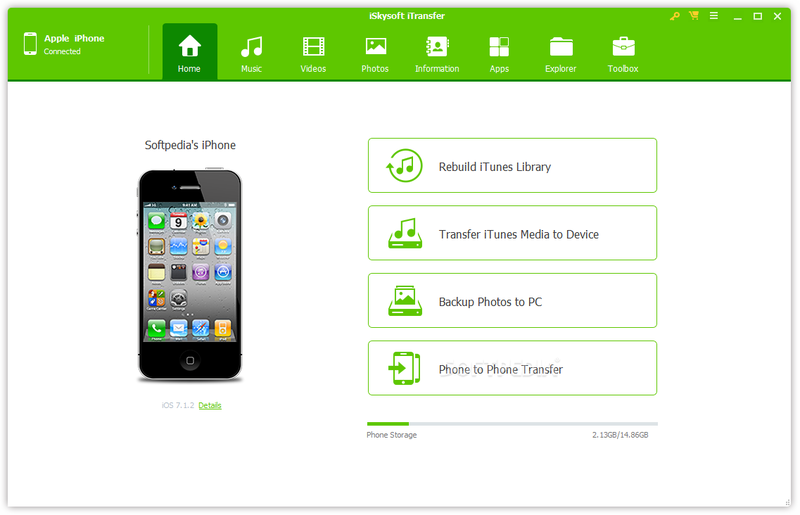 ), you can use this software as your primary iPhone file transfer manager because it does not require you to launch iTunes to backup, restore, or transfer your files. It has been proved the most popular CopyTrans Manager for mac Alternative. Two Way Transfer: Quickly transfer all your media files from iTunes/computer to iPhone and vice versa. Ultra-fast Transfer Speeds: relatively faster than any other tool available out there. Merge multiple iTunes Libraries: with 1-click merge feature of iMyFone TunesMate. Rebuild/Restore iTunes Library: rebuild your damaged or corrupted iTunes library fron your iOS device. Share without Limits: Share you entire iTunes library with your friends and family without any limits. All Media File Fromats Supported: File transfer support for all types of files including music, playlists, podcasts, videos, movies, photos, audiobooks, and more. Support HEIC Photos: View HEIC format photos directly on the software without any need to convert them first. Uninstall Apps in Bulk: Remove bloatware iOS apps in bulk and free up space on your iOS 12 iPhone quickly. Available for both Windows and Mac, you can get this amazing software for just $29.95. A trail version is available, so you can test the tool before making a decision. Dr.fone – Transfer is another great CopyTrans Manager for mac alternative that offers similar features such as transferring media files (music, videos, photos, etc.) to computer without using iTunes, manage your iPhone photos (preview, add, delete, add to albums, etc. ), full compatibility with iOS 12, and much more. Apart from these features, dr.fone – Transfer also functions as a powerful file explorer, allowing to explore each and every file and folder on your iPhone via Disk Mode. You can back up your iPhone apps with this software as well. 1-click media backup and restore options. 7-days money-back guarantee; you can request a refund if the product doesn’t meet your expectations. Some users have reported file corruption problem when transferring multiple files together. iSkysoft iTransfer is another software you can use as an alternative to CopyTrans Manager for Mac. It is equipped with wide range of features that will make your iPhone files transfers a breeze. Not only can you use iSkysoft iTransfer as your primary management tool, you can also enjoy many other features it has to offer. 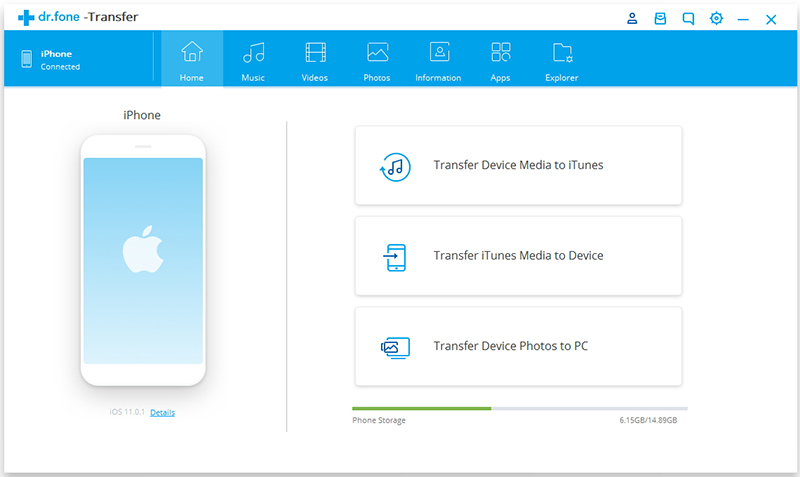 iSkysoft iTransfer offers all the necessary means to help you transfer many types of media files (including music, videos, movies, photos, etc.) from your iPhone to computer. Transfer speeds are great and the GUI is user-friendly, which makes this software fun to use and makes the transfers seamless. All-in-one phone manager for iOS 12 iPhone, iPod, and iPad. Fully compatible with all iOS devices. Relatively expensive as compared to other iPhone file transfer softwares (e.g. iMyFone TunesMate). This software is available for both Windows and Mac platforms. You can get this software for $49.95. Contacts Didn’t Transfer to New iPhone, How to Fix it? How to Download Podcasts with/without iTunes?